As soon as he shared the post, his family, as well as his colleagues, started pouring praises through comments. Amongst them was his rumoured girlfriend Malaika Arora. Malaika wrote, ''awesome'' and added clapping emoji at the end. She also commented on first poster of the film shared by the actor and the fire emoji on the picture. 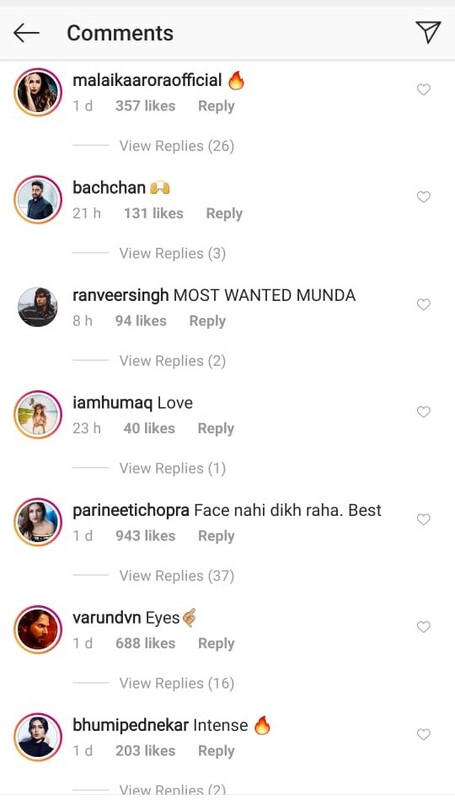 Apart from her, Parineeti Chopra also commented on the actor's post and said, "Face nahi dikh raha. Best." Varun Dhawan wrote "eyes," along with an emoji. Arjun's bestie and 'Gunday' co-star Ranveer Singh had the most quirky comment of all and said, "Most Wanted Munda." Directed by Raj Kumar, the film is slated to release on 24th May 2019.